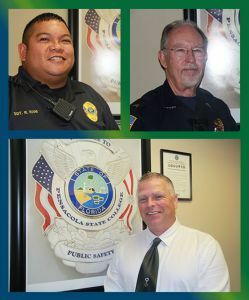 Three Pensacola State College Public Safety Department officers have been promoted. Lt. Shane Brannock is the department’s new Assistant Director of Public Safety. Brannock who has been back with the college since 2015 replaces Chief Sean Fagan, who was promoted to Director of Public Safety in May. 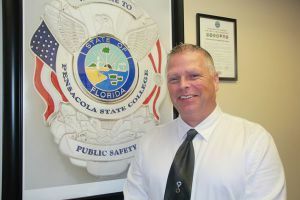 “This is a great work environment, there is nothing I don’t like about Pensacola State,” said Brannock, who has more than 15 years of law enforcement experience. His career started with the Lexington (North Carolina) Police Department in 2002. He also worked at the Pensacola State College Police Department from 2010 until he became the Collegiate High School Resource Officer in 2011. He left Collegiate High to become an officer with the Brewton (Alabama) Police Department. Brannock and his wife, Tammy, have four sons – including Kameran, a Pensacola State student enrolled in the Physical Therapy Program. Two other officers ─ Rick Steele and Rodney Rani – have been promoted to sergeants. 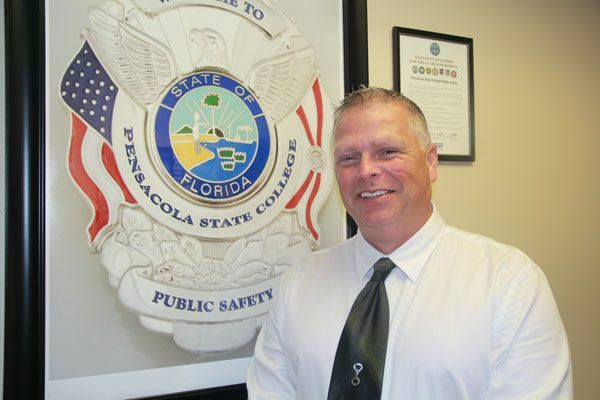 Steele has been with the college for about five years but has more than 40 years law of enforcement experience. 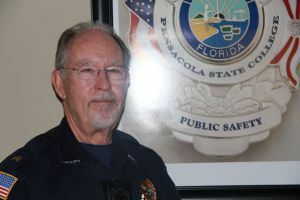 He started with the Pensacola Police Department in 1971 and retired in 2005 as a sergeant. In late 2005, he joined the Pensacola International Airport where he worked for more than three years. In 2012, he joined the college’s public safety department. Steele and his wife, Nancy, have a son, Stephen, who is a Milton firefighter, and two grandchildren. His father, the late H.O. Steele, was a longtime City of Pensacola police officer. 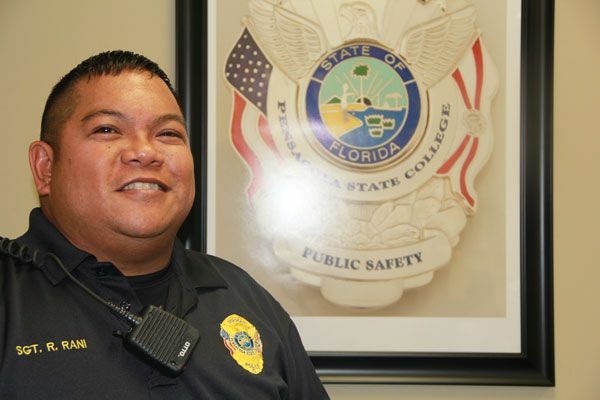 Rani’s career with Pensacola State began in 1994 when he was hired as a public safety department student assistant for the college’s Downtown Center ─ when it was located at Garden and Palafox streets. The law enforcement bug bit Rani in the mid1990s while he worked as a security guard at Seville Quarter. In 1997, he went through the Florida Law Enforcement Academy and was hired as a full-time officer with the college in January 1998. Rani is married to Lorie, an Escambia County Sheriff’s Office dispatch trainer and supervisor.